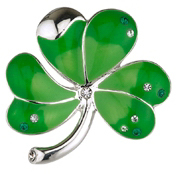 Shamrock shaped brooch with green enamel leaves for that authentic look. This item measures approx. .75" tall x .5" wide.